My vocation to the priesthood came to me in the way it often does: I was an altar boy in my parish and I was very inspired by the figure of two vice-parish priests working closely with their older parish priest. From there was born a great desire in my heart to become like them. The celebration of the mass, the preaching of the word of God, and their apostolic work aroused in that boy of twelve years a great enthusiasm and desire to be like them. Obviously then, their advice, their guidance, my entrance to the seminary at a time when I was already in secondary school continued to fortify my vocation for priesthood and I was ordained priest by Bishop Giuseppe Angrisani, in Casale Monferrato, province of Alessandria, in Piedmont. In a time that is characterized by a profound crisis of the family, how can one help society recognize family values​ more? What are the main challenges? I would like to answer this second question by connecting it with the first, because my priestly vocation had found a very favorable environment in my family in terms of faith and testimony (to it) of my parents and brothers and therefore a context of great sensitivity and Christian faith. Today the family is in crisis because faith has weakened, through the advancing secularization and moral relativism, also including the weakening of the values of the sacrament of marriage, (giving rise to) increases in the number of separations and divorces etc ... thus provoking weaknesses that affect many young people who are not sufficiently prepared to make commitments "forever". We as a Church undoubtedly talk about the value of the family founded on marriage between a man and a woman which is a sacrament for the believer and for the non-believer will only be a civil marriage. As a Church we insist on this, while many of our parliaments across Europe recognizes other types of families, and so it becomes difficult to influence legislators to defend family values. This is a great challenge, because the lack of stability in the family and the lack of love between a husband and a wife leads consequently to a lack of help for the children who grow up in a tattered educational environment and with poor values. This is a major challenge, because as a result, the Christian community must make up for what is lacking in many families especially in terms of education in the faith and also because faintly Christian families are keen to present their children for the sacraments and Christian education but without giving them the support of the faith and of Christian education based upon the Christian testimony. What do you think about the European Christian roots and the European Constitution? I believe that we Europeans are living at the level of recognition of our history with an inferiority complex, compared to other people who are not ashamed to call upon God and to put the name of God in their Constitutions. Europe should not fail to recognize that it is formed in a Christian culture and that the work of monasticism and the presence of Christian communities in education, and social assistance that has been crucial to characterize our European societies. That the European Constitution is not explicit about its Christian roots is really a miopic view of history and also a lack of truth with regard to what we are and where we come from. Many think that the church is in trouble when faced by changes imposed by modernism. What do you think? I believe that it is not true that the Church is struggling to deal with the changes imposed by modernism, because the Church has always pursued its own line of faith in Christ and his message of salvation to mankind. Undoubtedly, the modern challenges put many evangelical values under discussion​, especially the relationship between faith and reason that the Holy Father Benedict XVI defends so adamantly to say that faith enlightens reason and that reason needs faith as a way of knowing the truth. Faced with this situation I would say that the Church has no particular difficulties, even if it does not always find a sufficiently numerous audience or acceptance of its teaching. Modernism, which in some respects brings advantages in economic and social progress, often runs the risk of producing a fall, and even a spiritual winter. We have to be stronger in our witnessing and to combine the values ​of modernism with the faith, because faith illuminates what is great and beautiful that man can achieve in his individual and social history. What has changed in the past twenty years? Depending on your point of view of how you are raising this question. If I look at it from the point of view of faith I must admit that in the last twenty years and more, the setting of deep faith has been a general weakening with the spread of relativism both truthful and moral. If you look at it from the point of view of the conditions of life I would say that in the last twenty years there has been great progress in society, at least in Europe. But we must also consider the current economic crisis that has hit the world and large areas of poverty scattered in different continents of which we cannot ignore the seriousness. We have a duty to promote a global policy that no longer accepts that the rich get richer and the poor get poorer. One should really think that international organizations such as the UN or other equivalent organisations have to have more authority to direct the policies of the most influential countries in the world to realize the value of equity and justice for all. What are the new challenges of the Church? Firstly, today the Church is faced with the duty of a renewed evangelization. We have baptized people who profess to be Catholics, believers, but whose life does not match the loyalty to the Gospel and therefore, as rightly said by the Holy Father Benedict XVI, we need a new evangelization and I add a renewed evangelization first, because it is faith in God that is staggering and when there is an eclipse of God on the horizon of individuals, families and society, there is much to be feared so that one can outweigh selfishness and delusions of omnipotence on the part of individuals or of individual states. What makes today's Christians believe? It is a bit generic question because I believe that to make today's Christians believe, requires a continuous path of education from childhood to adolescence and from youth to adulthood. In our Christian communities there is a lack of faith, especially at the level of youths, adults, parents of children in their infancy, and of primary school children and it is very difficult to start with the deep convictions, which are valid then for life if children and young people don't have their parents' example of coherent faith. Lifelong learning especially for young people and adults is therefore to have this great commitment such that Christians are able to give witness of their faith even in this secularized society. How can one solve the vocational crisis? I do make a clarification. I do not think that today's vocational crisis arises from the lack of calls. Vocation means a call. The Lord continues to call even today, even if there is a lack of answers. The lack of answers has many reasons, the most obvious is that young people today are afraid of the word "forever". If one pays some attention it is not only the crisis of vocation to the priesthood or religious life, but there is also the crisis of the family founded on marriage. There is a great fear for a life commitment. The context of a weaker faith certainly does not help for a reply to the giving of one's life to the Lord and to the cause of the Gospel, which is especially a characteristic for the priesthood vocation. I must say that in Turin, for some years now, there is a growing number of young people who are moving to the priesthood. Although so far they are not so many, both the number and the quality of the young people who have expressed this commitment and act with great conviction both spiritual and intellectual, and even pastoral are growing. In the past, there were debates about the defense of the crucifix in public places, or more generally the issue of religious symbols. What do you think about this topic? Many things have been said on this subject that occasionally resurface. The presence of the crucifix in public places shows that all of our history is steeped in Christian values, I believe that the crucifix cannot be presented as negative, as an offense for someone. The Crucifix is for us who believe, the image of Jesus Christ, who gave his life for the salvation of all. Even for non-believers it is the sign of a testimony of universal love without distinction of persons. A symbol of high value that should be explained to those who are not Christians so that they can understand the message of universal love that Jesus Crucified offers to all of us. How do we find Jesus', true God and true man? How will he be present in the liturgy? Faith is born from the announcement, this is what St. Paul says in his letter to the Romans. So one has to proclaim Jesus Christ already in the family, in the Christian community and then through the great testimonies of charity, so common in all our environment. It would be enough to actually look at how many realities of solidarity with the poor, immigrants, the unemployed that today are multiplying around us to see how the Church is at that forefront of charity and hospitality. 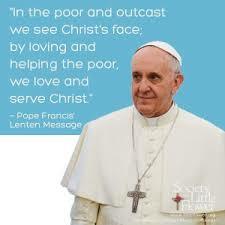 Civil society is doing its part, but the Church has always been the field of charity, throughout its history. Eminence do you remember the first time you met Karol Wojtyla? I remember very well the first time when I met the Holy Father John Paul II. 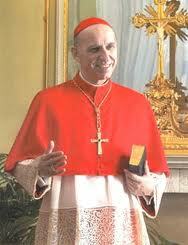 He came to Turin in 1980, when three days before I have just been elected Bishop of Fossano. The Pope met me together with all the bishops of Piedmont, I was not yet ordained bishop, but only elected. He did not know me on a personal level and I still remember the words he said to me on that occasion: "We have appointed a young bishop". That meeting with the Pope in Turin April 13, 1980 was my first of several other meetings that life and circumstances then gave me the opportunity to realize. Eminence, was there something in the personality the of Blessed Pope John Paul II that used to impress you? We can mention many things as important features that make us appreciate this Pope: his great ability to tune instantly with people, especially with crowds, his charm on young people for whom he invented the World Youth Days. But what I would like to highlight as a characteristic that struck me most was his capacity to stay in deep communion with God even in the midst of the activity with people, and in pastoral commitments. John Paul II was a man of prayer, he used to leave no gaps even in the smallest of intervals in his pastoral commitments without collecting and conversing with the Lord. He was a contemplative, a mystic. In what way, did John Paul II influence today's post-modern culture by his teachings and encyclicals? I believe that the 'Magisterium' of John Paul II is very rich even for the long duration of his pontificate. One cannot forget that he was elected pope in October 1978 and died in April 2005 and so his numerous encyclicals, the publication of the Code of Canon Law for the carrying out of the implementation of the Apostolic Constitutions and Conciliar Decrees, the publication of the Catechism of the Catholic Church, which are the best and most significant examples of his teachings, have undoubtedly influenced not only the Church, but also the whole world. 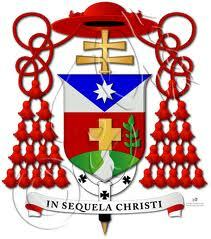 Eminence what do you feel as a person and as a prelate of the Church on the issue of illegal immigration? The issue of immigration is a problem that has to be addressed without any prejudices and without closures. Humanity has often found itself in the condition to live the phenomenon of immigration. Even we Italians, at the beginning of the twentieth century, had to immigrate in various parts of the world, even in a clandestine way, and many have managed to create a great future. I believe that immigration should be regulated by agreements between countries of origin and countries where these human beings arrive. Individuals or families who emigrate for a better future for themselves and for their children have the right to be accepted and helped. Undoubtedly, our society has a duty to defend itself when immigration is not intended for the social and economic progress of oneself and of one's family, but it is aimed at the commission of crime or exploitation of persons. Speaking at the city of Turin, an important centre for immigrants, I said many times and on several occasions that Turin should be characterized as a city of friendliness, of tolerance but still needs to be demanding. "Friendly" because we really welcome those who come honestly to find a job and improve their lives, "tolerant" because we need to accept all cultures and integrate these immigrants into our local culture while respecting their beliefs and their cultural positions, but also "demanding" because those who come to bring crime, prostitution or criminal behavior, can not be accepted and the state has a duty to defend itself even by referring this kind of people to their country of origin. But I believe that most of those who come here do not belong to this last category. Perhaps the Church must seek to be heard more about these topics? I do not believe that the Church is silent on these issues. If one reads the speeches of individual bishops, those of the Italian Episcopal Conference and the Pope's interventions, one realizes that the Church has never had any trouble in proclaiming the gospel principles of hospitality, solidarity, sharing and the aid to poorest. Just think of how the theme of love and solidarity, the Church has done and is doing today, for those who arrive through natural disasters that happen so often in the world. The twentieth century has been the century of mass media. The twenty-first century seems the century of the personal media: everyone creates his own information and tries to find what he has to find online. For you, prelates of the Church, what sort of challenge is this? I believe that globalization is a good thing if you live with a certain attitude and dangerous if one interprets it in a negative way in the sense of incorporating everything that is worse in the world, and the fact that globalization should lead people to look for the positive. Today, through the Internet and various information technology the whole world is in the living room. This can be a source of great opportunity for new knowledge, but can also be dangerous, especially for the younger generation. The critical ability to discern what is to be accepted and what is to be rejected is the result of education and maturity. Even for us men of the Church, it is an educational challenge. It is not prohibited, it is to educate a critical discernment. This applies not only to the most sophisticated means of communication, but also applies to the media in general, newspapers, posters, radio, television and the behaviour of people. I believe, however, that at the end of all this talk we should say that we must go forward with great hope and optimism, because even though evil seems to prevail and make more noise than the good, I am convinced that today the good is much larger than the evil. The men and women of our time carry very large positive values​. Who is honest and does good normally does not blow his own trumpet and does not make noise, but even in silence, could really be the backbone of humanity that needs to be supported and directed towards the only true Saviour who is the Lord Jesus. It is the proclamation of Christ that saves the world and the Church knows that it has to do this with ever greater conviction and enthusiasm. This is the real challenge of today, indeed the challenge of always that the Lord has entrusted to us, his disciples.